Wouldn't it be nice to have high-quality sound wherever you go in your home? 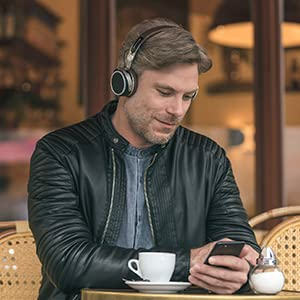 Blending ultimate ease of use with cutting-edge sound quality and luxurious comfort, Beyerdynamic Aventho wireless headphones provide a perfect supraaural (on-ear) fit. Convenient touch controls are right on the ear cup. And they use the latest Bluetooth technology for high-definition wireless transmission. 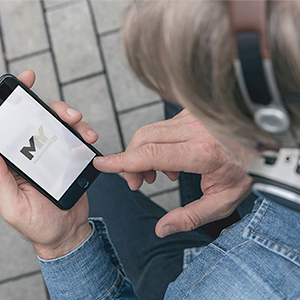 Rediscover your favorite music with the Beyerdynamic MIY (Make it Yours) app and its award-winning sound personalization features. 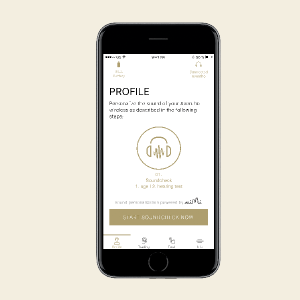 A certified test analyzes your hearing; Aventho wireless then precisely conforms to your personal hearing profile. 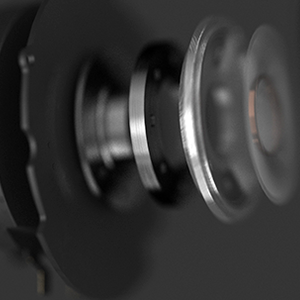 The result is stunning sound quality, rich with details you've never heard before. This is the high-tech future of headphones. And it's yours today with Beyerdynamic Aventho. You probably never imagined Sweetwater would use the words "wireless" and "audiophile" in the same sentence. Aventho changes all that. Beyerdynamic's Tesla headphone technology and the latest Bluetooth transmission codecs work together to envelop your ears in high-definition sound that's perfectly tailored to your own hearing. How? 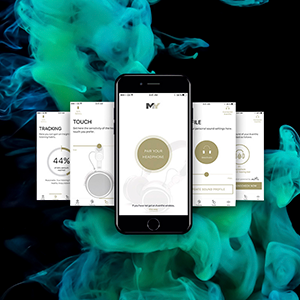 Using sound personalization features developed by Mimi Hearing Technologies, the Beyerdynamic MIY app analyzes your hearing and creates a personal profile that Aventho wireless then applies to the music you hear, correcting for frequency deficiencies. No one — not even the most golden-eared of audiophiles — has absolutely perfect hearing. But you do, with Aventho headphones. Say goodbye to cables. 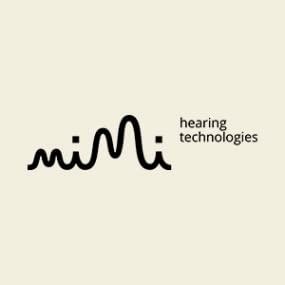 Whether you're at your desk, in the kitchen, or relaxing in your armchair; your music can now follow your every move — with stunning sound quality. Aventho wireless blazes new frontiers, blending ultimate ease of use via its intuitive touchpad and state-of-the-art Bluetooth transmission. Beyerdynamic equipped Aventho with the best wireless technology available, optimized for hi-resolution audio: Qualcomm aptX HD and Apple AAC, plus aptX LL for minimum-delay audio transmission with when you're watching TV and videos. With Beyerdynamic's Tesla technology, Aventho headphones deliver a staggering wealth of sonic detail. The cushy pads comfortably nestle against your ears as you are immersed in an enthralling, spacious soundstage with deep and precise bass; lifelike, liquid midrange; and silky, extended highs. Beyerdynamic studio and audiophile reference headphones are legendary for their sound quality. Now you can enjoy this sonic bliss in any room in the house, with liberating wireless freedom.